ICDSoft has been in the software market since 1993 and soon expanded to provide web hosting solutions in 1999. 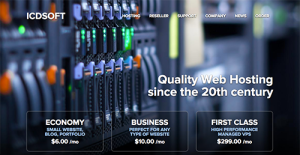 Not long after, ICDSoft garnered a huge spot in the web hosting industries. Today, the company serves thousands of customers, delivering top class web hosting solutions to businesses based in more than 140 countries. ICDSoft offers a guarantee of 99.9% uptime to its customers. To ensure that such uptime is achieved and maintain, ICDSoft employes an automated monitoring system developed to spot potential issues that can impede server and network performance, allowing technicians to fix the problem and preempt any instances of downtime. How Much Does ICDSoft Cost? ICDSoft offers an intuitive online control panel that is developed by their in-house specialist. This control panel provides all the basic and a number of advanced tools and features to help users achieve total control over their accounts. Each company has its own characteristics, and can need a special solution that will be adjusted to their business size, type of clients and employees and even specific industry they deal with. It's not wise to count on locating an ideal service that will work for every business regardless of their history is. It may be a good idea to read a few ICDSoft reviews first and even then you should keep in mind what the hosting service is intended to do for your business and your employees. Do you need an easy and intuitive hosting with just essential features? Will you really use the complex tools required by pros and large enterprises? Are there any particular tools that are especially practical for the industry you operate in? If you ask yourself these questions it is going to be much easier to locate a trustworthy service that will fit your budget. We realize that when you make a decision to buy Hosting Services it’s important not only to see how experts evaluate it in their reviews, but also to find out if the real people and companies that buy it are actually satisfied with the product. That’s why we’ve created our behavior-based Customer Satisfaction Algorithm™ that gathers customer reviews, comments and ICDSoft reviews across a wide range of social media sites. The data is then presented in an easy to digest form showing how many people had positive and negative experience with ICDSoft. With that information at hand you should be equipped to make an informed buying decision that you won’t regret. ICDSoft provides customers continuous 24/7 technical support through its ticketing system and email. The company guarantess that the response time to any ticket is within 15 minutes while email support is within 1 hour. Articles via its online documentation are readily accessible to customers who are looking for immediate answers to trivial and simple matters and concerns. What are ICDSoft pricing details? ICDSoft offers a guarantee of 99.9% uptime to its customers..However, there is no mention of refund for downtime incidents. Yes. ICDSoft offers WordPress in several of its hosting plans. No. All packages do not feature a free domain offer. ICDSoft only offers Linux-based hosting. ICDSoft accepts payments via major credit cards and PayPal. ICDSoft offers various security blankets to ensure the integrity and reliability of their networks. Aside from the usual SSL certificates, the company employs various systems to ensure that performance of their facilities are maintained at the optimum level. This means top class security systems, HVAC, utilities, backup power and contingencies, as well as physical security. All facilities are constantly monitored and every hardware are properly maintained, updated, and upgraded. ICDSoft comes with a free in-house site builder loaded with the features you need to create professional looking websites even if you do not have the expertise of a programmer or IT specialist. ICDSoft is an ideal eCommerce option because of its affordable pricing, reliable network, and fast customer service. SSL certificates are offered to provide an added layer of security. It is also easy to have eCommerce applications working with a number of ICDSoft plan. These applications include, Zen Cart, X-Cart, AgoraCart, Cube Cart, Lite Commerce, Ubercart, OS Commerce, and ShopSite. No. ICDSoft provides up to 5000GB data transfer.